The churches I grew up in were staid and low energy. It says something about our current culture that I even have to qualify this, but I don’t say this as a critique. I was raised in these church environments, and my faith was fostered and informed in these churches. I don’t regret it. Our churches worshipped a capella, and most men wore suits. People’s body language was not very expressive, and the sermons were more like a Bible lesson than anything a skilled orator would deliver. Our worship services were usually the same format. There wasn’t much variety. 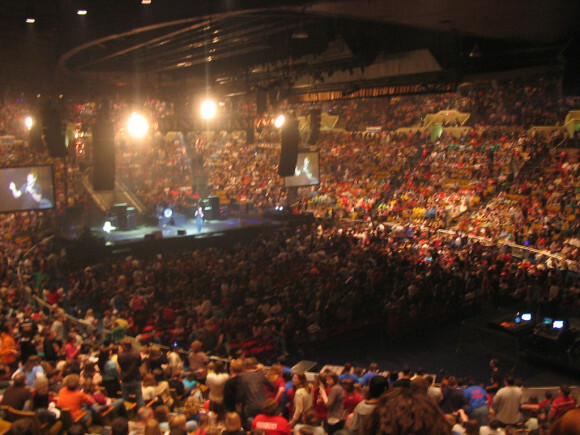 I never regularly attended anything close to a megachurch or, for most of my life, experienced anything resembling modern contemporary worship services. Though I don’t have an allegiance to worship with these characteristics, I have stayed in churches whose worship is not too different from what I grew up in. Unlike the congregations I grew up in, a feature of evangelicalism seems to be the pursuit of a great experience in church. I don’t want to sound as if I’m dismissing the importance of our experiences. I don’t see a well-planned conference or retreat as pointless. But I find it interesting that many Christians––especially evangelicals––make these experiences the cornerstone of their spiritual lives. And a dynamic speaker and a nice environment might not even be enough. People want more innovation in worship. The thrill that many people seek isn’t just a great experience, but an innovative and ever-changing experience. Christians chase these experiences, and churches cater to them. Some churches grow their numbers through “sheep stealing”: not converting non-Christians, but getting Christians from other churches who find their the experience better than their old church. Why do so many Christians find it important to pursue these experiences? It’s too cynical to say that they do it just for enjoyment. If people were just interested in entertainment, then they would be elsewhere. There are much more entertaining events than church services, even the most exciting ones. Instead, I think many people pursue these experiences because they think these experiences are what really change them. This is unsurprising. People have experiences that change them. This often begins in youth group. A great experience on a mission trip or a youth camp or a retreat changes people. They come back with renewed energy and a changed outlook on life. And so they begin to think that most of their spiritual transformation comes from such experiences. They think it is retreats or an amazing Sunday morning or a mission trip that makes them more like Christ. But I think this is wrong. It’s not that I don’t think that these experiences change us. They have a positive effect. But I don’t think that most of our spiritual transformations are the result of these experience. I come down firmly on the side of habits. It’s been my experience, both personally and through discipling others, that our habits change us more than our experiences. Many times someone has told me that some trip or great experience has made them decide to really follow Jesus. For a few days, there is a discernible difference. But in all but one or two instances, they don’t follow through. But the people who focused on developing Christian habits fared better. They grew in holiness and faith more consistently than the people who seemed to rely heavily on seeking a great experience. Yes. The unforgettable trip or terrific sermon affects you. But not as much as we often assume. Instead, these are breakthroughs that are set up by all the forgettable sermons, the lackluster worship experiences, prayers, Bible study, and the other habits and routines we don’t think much about. I concede that Peter, James, and John had to be spiritually impacted by viewing the Transfiguration of Jesus, and the Twelve had to be amazed at Jesus’s amazing acts. But between these moments are hours and hours of spending time with Jesus, going to the synagogue, discussing the Scriptures, watching Jesus minister to the crowds even though the disciples were tired and hungry and bored, and seeing Jesus pray fervently. I am contending that these moments mattered much more than we usually assume, and that we go astray when we ignore these moments in our lives and instead race toward the next exciting experience. I think many people would find this unexpected, because habits and routines are boring. There is an assumption, especially among younger Christians, that if something is boring it’s not worth the effort. How many people leave a church or ministry because they find it boring? (The answer: a lot.) These Christians don’t see how crucial it is to develop these habits and routines, even if they find them boring. And they don’t pursue them. This basic decision –– whether you will seek experiences or form habits for your spiritual transformation –– deserves to be thought about because it’s crucial for several reasons. First, you have to answer this question if you are going to ben intentional in your spiritual formation. You have to decide what will mainly drive your spiritual growth and invest in that. If it’s experiences, then you will seek out more and more amazing experiences. But if it’s habits, then you will begin inculcating the habits of prayer, gathering with other Christians, reading the Scriptures, and so on. No. You won’t necessarily skip conferences or retreats or mission trips. But you will know that your habits, routines, and disciplines will matter more to your spiritual life than attending endless retreats. I don’t think this is an idle concern. Rather, I think many Christians are in this situation. Perhaps you agree with me about developing Christian habits as being more important than seeking amazing experiences. Perhaps you don’t. But I hope you can agree with me that thinking about this question has to be a foundational concern of your spiritual formation. Don’t put your Christian life on autopilot. And don’t just assume that experiences that are the most memorable are therefore the most transformative part of your Christian life. Maybe they are. I’ve argued that they aren’t. But you need to answer this for yourself and align your life with it. Micah, this blog has been helpful to me to focus more on my rhythms of prayer and biblical reflection and to follow Becky more in her disciplines. Thanks.